T-Mobile CEO John Legere might be feeling his oats these days. After all, T-Mobile is about to turn on its first LTE market and the carrier will finally be seeing its name on the Apple iPhone some time in the next few months. Toss in the mobile operator's new deal with Major League Baseball and the MetroPCS merger, and you have one optimistic executive feeling powerful. 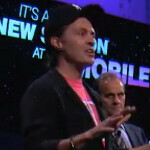 During an appearance at CES 2013 in Las Vegas, Legere was discussing how T-Mobile's network in New York City is better than Verizon and AT&T service in the city. He speaks to someone in the audience from New York and is an AT&T customer who apparently isn't happy with his service. Legere then calls AT&T's network "crap". Check out the video below to see Legere make his four letter assessment of his rival. He takes the stage at the 1:22 mark. What is the saying? - A gaf is when one is caught telling the truth at an in-opportune moment? "CRAP" @ 2:19 mark, Holy Guacamole!!! Im in the same crap network... hehehe... but not living in NY. But my LTG is fast where I live. Are you in New York? And he probably wasn't referring to the now pretty darn old GS2. Tmobile has more 42mb/s 4g than ATT.. ATT calls anything over 7.2mbs "4g" when its not... hello iphone 4s! lol. As of the last PCMAG speed test, Tmobile was second only to VZW's LTE, and not by much.. they both handily beat ATT. Tmobile has nearly the same coverage map as ATT yet costs half the price. $70 a month for true unlimited with no caps or throttles on Tmo.. good luck getting that on ATT or VZW. ATT is still surrounded by edge as well. The only network that has full 3g is VZW (which is only barely faster than EDGE to begin with). and soon they will be full 4g. You dont see me talking a lot of crap about VZW do you? why? because your actually paying for the best network. I dont like their phone policies and I dont like the pricing, but at least you get what you pay for IF you need that much coverage. ATT's network is not any better than Tmobile's (Tmo's data handling is actually much better than ATT's), yet your paying VZW pricing... which means ATT is a complete rip off. Its always about location location location. Location and then price should be the 2 big factors for picking service.. not what lame phones they have. Where I'm at in Jacksonville Tmo and VZW have by far the best coverage, and its pretty equal. Why would I pay nearly double for VZW if I dont need to? Yea, Tmo needs to desperately upgrade their 2g and GPRS network up to at least 3g, but their 4g covers over 80% of the population, so for most people its not a worry. If you'd rather have VZW or ATT, that's up to you. However it does not negate a single thing I said about ATT. I know but not as much edge as tmobile and like u said location I live in Puerto Rico at&t has the whole island covered in 3G and the most Lte , Claro is second on 3G with a few Lte markets , sprint third ,4th tmobile since they bought suncom they haven't really improved coverage here. And I get what I pay for because since there's no VERIZON here in the island nada I have att which actually works I haven't dropped a call since 09 yes I.pay a lot 110 for 1 phone on att but at least I know I can go from san Juan to vieques island and have reliable 3G coverage were as tmobiledont work in vieques . lol, you lost all points with me when you said edge is just as fast as vzw 3g (evdo) 1xrtt is as fast as edge is. real world edge speeds our right around 100 to 150kbps with sometimes better latency then 1x. this is real world class 10 12 edge. that comment is a joke. Its not even close. edge is equal to 1x not evdo. Amigo, you are absolutely correct. However, is all depends how you are going to use network/services. For example, ninety percent of the time I'm surrounded by wifi, so basically my needs are mostly text and voice, and you can't beat T-mobile for $30/month plan. You can't even get a glass of water for $30 at Verizon or AT&T. And Verizon should have their entire 3G service area covered with LTE before the end of the year, possibly as soon as mid-2013. Everyone else is 1-2 years at least behind Verizon in LTE rollout. If you want more coverage everywhere, Verizon, like it or not, is the way to go. Good point. I would add that people like to b*tch and moan about how expensive Verizon is, and I agree they are ($90 for one line unkl talk & txt ONE GB data) but they invest that money right back into their infrastructure and network. Well, they should provide good coverage, no excellent service for $100. Almost more or the same as my land line service and cable TV. @remixfa there is probably hundreds of miles around here where at&t works and T-Mobile does not. Its not "almost" the same coverage. T-Mobile covers big cities and towns which is where they can claim they cover such a high percent of Americans. But out in country areas, Verizon and at&t are far superior, and Sprint is becoming more competitive in these areas. Well t-mobile's network also ain't that great in NY ..I think in NY at&t is a Lil bit better when I was there 2 weeks ago my galaxy note 2 from at&t was always faster than my sisters galaxy s2 from tmobile data wise atts LTE in NY left tmobiles hspa42 in the dust I saw speeds up to 30 mbps on att Lte highest I saw on tmobile was 20 and coverage wise I had more better coverage in upstate NY on at&t than on tmobile. And dropped calls I had none I was afraid of NY cuz I have att n I had read so many bad things online about horrible coverage ,dropped calls to my surprise while I was there I had better and faster speeds than my sister on tmobile and better coverage and no dropped calls. punctuation is your friend... holy crap. Whatever I'm at work so I had to write it quick I don't have time to read every single word I write . Neither does anyone else, I'm not going to give myself a headache reading that. you pay for better service with VZW. you pay to be ripped off with ATT. Higher price does not equal better service. ^ There's a great amount of truth to this. Completely depends on your market. I used to have tmo, which sucked. Then I went to Verizon, which was a considerable amount better. However, the best service in my area is AT&T, and since I made the switch, I've been completely satisfied. Obviously, service depends on where you work and live. For example, in my neighborhood, Verizon's vaunted "network" does not function well at the Staten Island Ferry Terminal, within the Staten Island Railway train yard or surrounding area without continuously dropping calls without warning. They do not respond to repeated complaints about this poor service, even after years of repeated complaints. AT&T is another matter. Due to an excessive number of iPhones that clog their limited band-with, the reliability of voice calls has deteriorated to the point that people at the other end of phone calls often beg or demand that I hang up and use a land-line to continue our conversation (due to static and sound level drop-outs). Calls to voice-mail on AT&T are also challenging, often failing to complete, or jumping into the middle of the voice recordings without warning. AT&T text messages also fail to send with alarming frequency. Sprint service is intolerable in my area. I recall setting up my voice-mail announcement three times in an attempt to eliminate static and artifacts (I did not succeed). T-Mobile on the other hand always has consistently high quality, clean, clear, fully intelligible voice communication. Is their signal as prevalent as those provided by AT&T or Verizon, honestly no, not at all. However, they are always improving, innovating and making the network that is available, usable, enjoyable and appreciated by the listener at the other end of the phone. I wish that I could say that for AT&T. If so, I would be an iPhone user, but I cannot abide the noisy, trashy, ham radio sounding drone that accompanies the AT&T network. I would rather use a land line, twiddle my thumbs, read a book or play a mobile game until I enter an area where excellent T-Mobile voice service is available.